Sicily is a unique location in which to study Italian abroad, famous for its relaxed, easy-going lifestyle, marvellous climate and friendly locals. Located in Sicily, overlooking the Ionian Sea, Taormina a is a beautiful hilltop town, brimming with fascinating history and magnificent architecture. Visit the ancient Greek theatre, practise your Italian skills in one of the town’s lively bars, or simply take a stroll around the magnificent surrounding countryside whilst soaking up the glorious Italian sunshine. What’s more, Taormina is a perfect base from which to explore the rest of Sicily, including the delights of Syracuse, Palermo and Monreale! 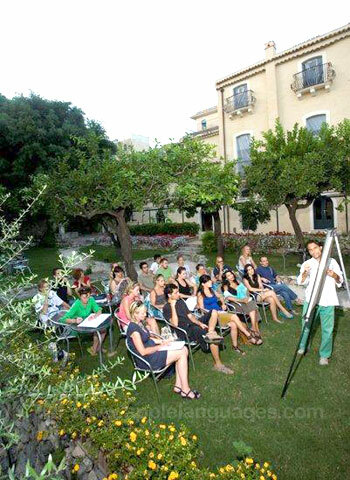 Our Italian language school in Taormina, Sicily, is located in an historic villa, in the centre of Taormina, just 200m from the Greek Theatre. 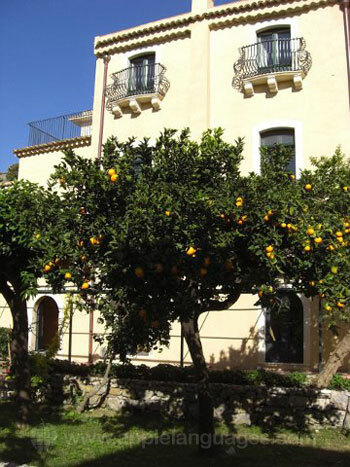 The school sits in beautiful botanical gardens, which along with the villa are protected by Soverintendenza alle Belle Arti (the national agency for the preservation of arts and monuments). As well as fully air-conditioned classrooms, the school has its very own kitchen where cookery lessons are held, and a cafeteria for students to get hot and cold drinks and snacks in between lessons. The school is also a centre for cultural studies, and regularly hosts book presentations given by authors, a Cine Forum and live theatre performances and concerts. 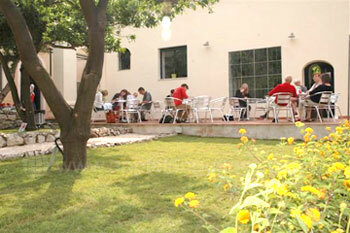 In the summertime, the school’s gardens also play host to sculpture and painting exhibitions. If you would like to learn Italian but still have plenty of time to explore the island of Sicily, you can take a Semi-Intensive Italian course of just 10 lessons per week. Alternatively, to learn at an even faster rate, choose an Intensive course of 20 lessons per week or even a Super-Intensive course of 30 lessons per week. If there are specific areas you wish to focus on during your Italian language-learning, a course of Private Lessons may just be the perfect choice for you. You can even choose to combine your group lessons with individual tuition on an Intensive + Private Lessons course. If you are studying for the internationally recognised CELI language exam, you can choose to take an Examination Preparation Course. On this course you will gain a thorough understanding of the style and structure of the CELI examination, and have the opportunity to prepare using authentic materials, including past exam papers. If you are aged 50 and above and would like the opportunity to learn Italian uniquely with other students of a similar age, you can take one of our Club 50+ courses, which combine Italian-learning with a variety of activities and excursions. We also offer a variety of cookery courses, including an Intensive + Local Gastronomy course which gives you an insight into the foods and wines of Sicily, as well as an Intensive + Cookery course, giving you the chance to combine your Italian lessons with Italian cooking workshops. If culture is more your thing, why not opt for an Intensive + Cultural lessons course? 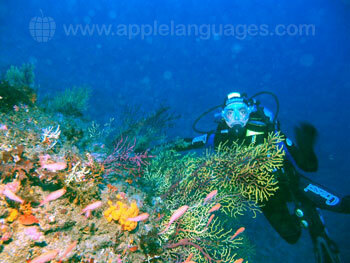 Our school also offers An Intensive + Diving course, allowing both new and experienced divers to experience the underwater delights of the sparkling Mediterranean Sea. For a complete immersion into the Italian language and culture, choose to stay with one of the school’s carefully-selected host families on a bed and breakfast, half-board or full-board basis. For a little more independence during your stay in Taormina, our school also arranges accommodation in self-catering shared apartments, where you will live with other students from our school. Alternatively, choose a studio apartment if you would prefer the place to yourself. Our school in Taormina offers a lively activity programme which is designed to help you discover the local area and Italian culture, as well as giving you the perfect opportunity to socialise with your classmates. 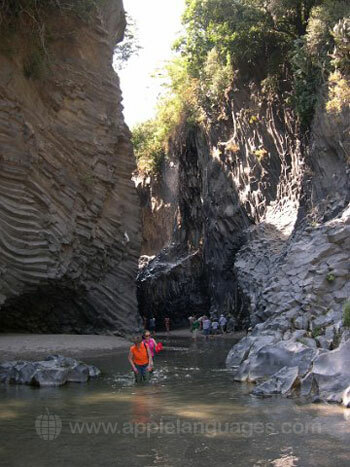 Some examples of activities arranged by the school include lectures and seminars, guided walks, Italian film screenings, theatre and concert trips and excursions to places of interest within Sicily, such as Mt. Etna, Palermo and Syracuse! Our Italian language school in Taormina can arrange airport transfers from Catania Airport for an additional fee, if you would like to be met on arrival and taken to your accommodation. Average score for our school in Taormina based on 41 previous client reviews. 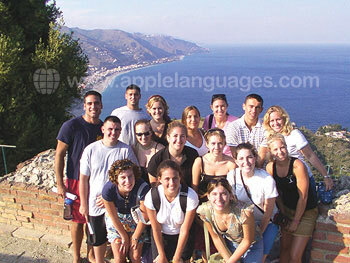 I loved my experience [in Taormina] - a great school. I feel more confident and determined to keep learning. I decided to concentrate on the grammatical side of my Italian this year. My teacher Michaela was excellent, very clear and concise with her instructions. This is my second year to do a course in Sicily and I will certainly return to do follow up courses next year. School set up alongside a shady courtyard was lovely. Courtyard cafe set up ideal for socialising too. Interesting mix of students and good teaching. But I was very glad to escape the afternoon heat to my hotel's poolside for homework. 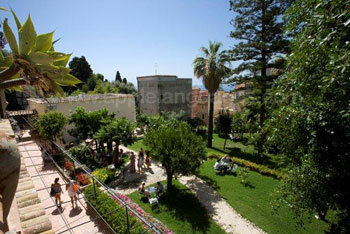 The school in Taormina was excellent. 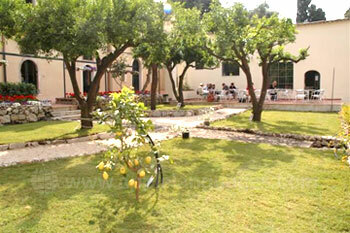 It is situated in a beautiful location. I enjoyed the classes, the staff were very helpful and assisted in every way possible. 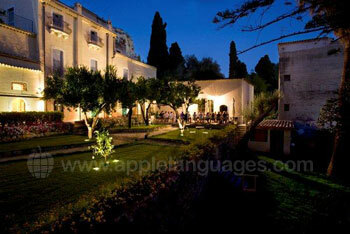 The school provides extra curricular activities also so there is always something to do in the evening. My accommodation was very good. I had a nice clean bedroom, with a view over looking the sea. Maria the lady of the house was very helpful. I had no complaints at all. I would just like to say I had a very enjoyable two weeks in Taormina. I will definitely do the course again next year, but this time I will book an apartment rather than stay with a family. That is just a personal choice and no reflection on the family at all. Everything was excellent. Good teaching. Good mix of ages. Management v concerned that it should be good and level appropriate. THe accommodation had wonderful and fantastic views but I was not told clearly how many tiring stairs there would be. Had I known I might have sacrificed the view of Etna for a place I could go back to during the day. Otherwise I had to climb about 100 metres up steps twice a day. Ok if you are 30 but not 65! The course was very well organised and every lesson started on time. The lessons were all well structured, stimulating and enjoyable. I was very impressed by the school - the cleanliness, the organisation, the facilities were all top rate. I had a very nice apartment with my own gate and door so that I was free to come and go as I pleased. I was very happy with my accommodation but the only problem I encountered was with the mosquitoes. I would recommend the school in Taormina to anyone wishing to study Italian - it is very friendly, extremely well organised and the teachers are second to none. Friendly teacher, well-structured class thorough introduction on first day Landlady was very friendly, nice & well-equipped studio appartment. The teachers were excellent. 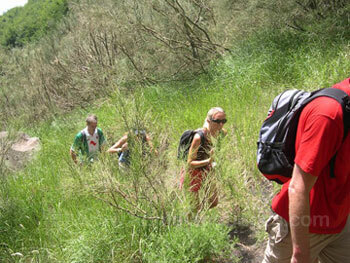 The extra-curricular programme was also excellent, especially the trip to Mount Etna. I was made very welcome in my host family. Even though I paid for just bed and breakfast I was invited to have dinner three times. I was very happy with my room and particularly because there was air conditioning. I have done many courses in many languages and the garden of the school was really better than any outdoor social area I have experienced to date.I also liked that there was a really broad age range of people attending the course. The school was well organised and a small number of students per class. The classes were well structured. The accommodation was basic but clean and the people were friendly. The school was lovely, good food, really lovely staff, and the standard of teaching was high as well. All the teachers were good. Absolutely gorgeous apartment, and apparently one of the best on offer - thanks! The course was excellent. The teachers were friendly and approachable, the lessons varied and interesting and the outings with Club 50 were well run and to places of great interest. My host and her children could not have been kinder. they included me in their Easter festivities and even encouraged me to invite a couple of friends. The food was quite basic but it was flavoursome and made with good quality ingredients. They were a very relaxed family to live with. The course perfectly suited for my level. I would recommend my host family's cooking to anyone. Yum! Generally excellent. Good, knowledgable and helpful teachers, excellent approach to learning. Especially liked the grammer 1st, repetition and then practice for 1st session; then opportunity to practice again in more relaxed 2nd session. I started as a complete beginner, and I developed so much knowledge from the course. My host family was great. They were kind, helpful, and amazing people. 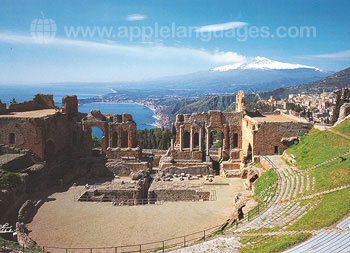 I hope that in the future I will come back to Taormina to study more. The courses where good and very helpful. My accomodations were great, my host family's house became home in no time. Very nice lady, and good kids. Great view from the terrasse. It was fantastic! I really enjoyed my two weeks in Taormina, the time went very fast. The teaching was excellent and the teachers were great. I am definitely coming back, want to stay for a month but if my work commitments wont allow this then I will be back for two weeks. My accommodation was very comfortable and the host was very helpful and very pleasant, the food was also good and very varied. I really enjoyed my course and feel I have learnt a lot in the week that I was there. On the first day we were made to feel most welcome at the school. I hope to return next year and hopefully stay for more than a week. In the meantime I will continue with my Italian studies. The accommodation was good,a nice sized room with a television, big bed and a desk which I used for homework etc. ensuite was a toilet and shower. The staff were friendly and efficient. The breakfast was good, and it was different every day. 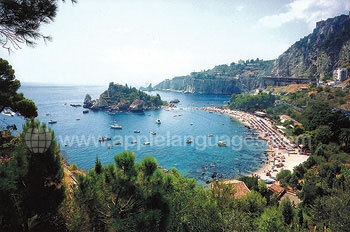 I really had an enjoyable stay at Taormina and wished I was there for longer than a week. The teachers were friendly. There was a sice terrace on top of the buillding to relax. The activities in the afternoon were interesting. Our tutor was informative but also very entertaining, lively, simpatica! We also attended a really interesting talk by another tutor - this was optional - on Italy over the last 50 years. He also was clear and informative, we were delighted to be able to folliow it for 2 hours! Our accommodation was in a tall, old house 2 mins from the school - very convenient! There were constant comings and goings in the house (family, friends, students) but the hosts were very friendly and the food excellent! Taormina is stunning! It would be difficult to imagine more stunning views than those from the school terrace where we ate lunch (even in January!) to blue seas way below and Etna gently smoking in the not-too-far distance! The course was really well taught, with some great teachers. The accomodation was really nice in a really nice area. This is my third year! 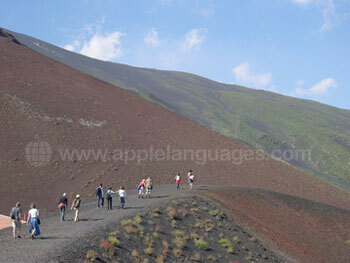 Italian… by the Mediterranean and under Mount Etna. 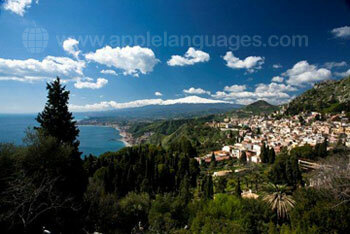 Taormina – A great place for holiday or study or both! My trip to Taormina, a real Sicilian treasure!